Tallahassee Police Chief Michael DeLeo, left, and Leon County Sheriff Mike Wood, right, joined Rev. R.B. Holmes, center, at a Tuesday press conference to kick off Solidarity Weekend. In a gathering that resembled a summit, the heads of both branches of law enforcement in Tallahassee outlined steps that they are taking to insure that the city doesn’t experience the type of violence that has been gripping the country during this summer. 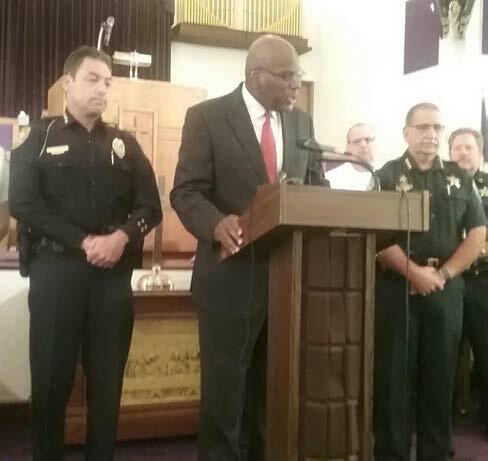 Tallahassee Police Chief Michael DeLeo, Leon County Sheriff Mike Wood and Fire Chief Jerome Gaines joined Rev. R. B. Holmes on Tuesday morning to announce plans for a Solidarity Weekend. 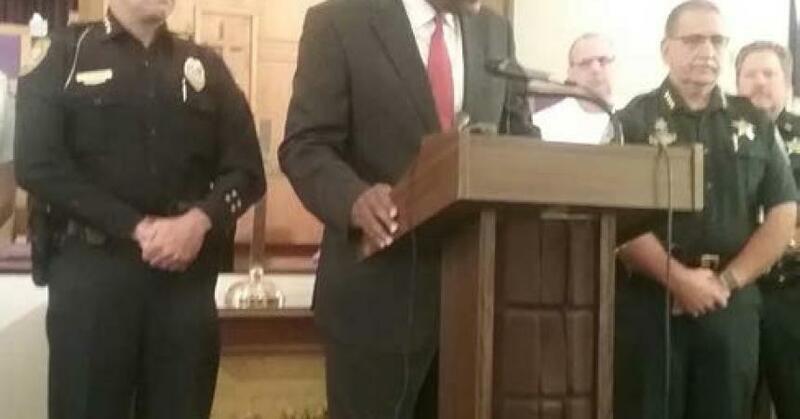 It will begin with a Saturday afternoon picnic at Bethel Missionary Baptist Church’s Family Life Center at 4 p.m. and conclude with a worship service at the church Sunday at 11 a.m.
Holmes said the conversation won’t stop after the weekend. He plans to form a force after the elections this fall, calling on the state attorney general and other top law enforcement officials to help find answers. The idea is to bring the community into the conversation on how to resolve social issues that have strained the relationship between law enforcement and the people they serve. Churches around the country are being asked to stage a similar event to engage law enforcement officers with their communities, Holmes said. The latest twist in confrontations with police occurred in Milwaukee this past weekend when Sylville Smith, a Black teenager, was shot by a Black officer. That followed highly publicized incidents in Baton Rouge and Houston earlier this summer. That Tallahassee hasn’t had any rioting over police-involved incidents, is the result of constant dialog between law enforcement and residents, DeLeo and Wood said. DeLeo went on to outline some of the programs that his department has in place to engage communities, including Operation Safe Neighborhoods and police forums at community centers. All summer long, TPD has offered programs for young people that include Splash and Jam nights for teens and a Friday night basketball league. The Sheriff’s office also offers several outreach events such as reading to students at daycare centers, reaching at least 50 children each week, Wood said. Wood said he personally mentors some children and his agency also offers an adventure camp during the summer. “As we move forward, we do have to have our hearts and our ears open to listen and to dialog,” Wood said. “But at the same time, it’s a community effort.